Puglia (or Apulia in English) is located in the south of Italy – in the ´heel´ of Italy’s boot. It is very far removed from hilly Tuscany. Its landscape is flat and wild – a sort of maquis in parts. Covered in huge olive groves delineated by dry stone walls, it is almost totally surrounded by sea. Puglia has more in common with Greece than mainland Italy and in some parts people still speak Greek. Puglia is associated with trullo houses – white stone buildings hand-built without mortar and topped by black conical roofs and so charming that they have been given UNESCO World Heritage status. 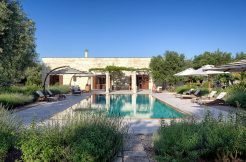 Supply is limited however and they can be quite claustrophobic, so visitors are turning to another traditional type of Puglia house — the Masseria or fortified farmhouse. These houses are spacious, light and cool, ideal for long, hot summers. And now, thanks to the innovative thinking of local and professional building companies, a 21st century version of the traditional masseria is available. The masserie that we present to our guests on this website are based in Salento, the southernmost tip of the region and within easy reach of two international airports, Brindisi and Bari. It is about twenty minutes from Lecce, “the Florence of the south”, ten minutes from Otranto and all beaches. Salento is ideal for discerning clients who would like a bespoke slice of the Puglia lifestyle.